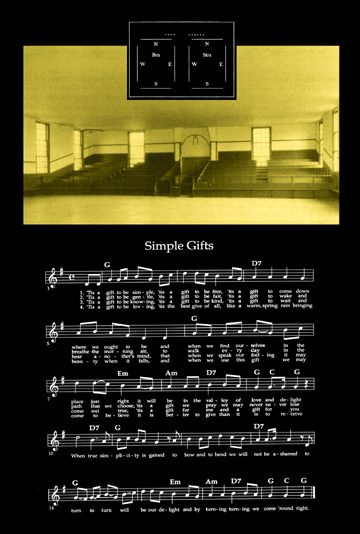 “Simple Gifts” is the title of a popular XIXth century Shaker song. The American Shakers, officially known as the United Society of Believers of Christ’s Second Appearing, were a religious group that emigrated from England to the United States and settled in upstate New York at the end of the Eighteenth century. The Shakers, who believed in a life of celibacy and virtue, excelled in creating architecture, furniture, and crafts. They became known as the “Shaking Quakers” given the way in which they moved their body during their religious dances. The Shaker group dances (such as the “Hollow Square Dance” of which the diagram is displayed) would take place in their so-termed Meeting Houses. The Meeting House of Watervliet, New York, which can be seen in the present image, belongs to the oldest existing Shaker settlement in the United States. Although the Shakers are practically gone as a practicing religious group, this structure still stands as one of the last of its kind. It is also one of the oldest examples of public architecture in New York. The Shaker songs and dances, such as “Simple Gifts”, summarized their ethics of tolerance and love – as they professed equality of the sexes and races. “Simple Gifts” was incorporated in the musical composition by Aaron Copland “Appalachian Spring” (1943-44), written amidst the Second World War for the company of Martha Graham. In the work, Copland was seeking to find the basis of an American idiom. In recent months, I have been concerned mainly with the way in which artists have related to tragedy and summed up particular psychological collective feelings in our society. Additionally, in New York, there is an ongoing questioning as to what kind of memorial should be constructed on the site where the terrorist incidents took place.The site of the World Trade Center has acquired an inescapable weight for the history of the city. In the last year, we have all experienced the international continuing instability of a world where we continue to see a fundamental contradiction between our proclamations for peace and the continuous strive for individual gain, particularly in the new global economy that has been implemented by the United States policy that promotes the interests of war over the ones of cultural understanding. In reflecting on these issues, my impulse has been of an introspective and retrospective questioning on how many of the international world problems may be due to the discrepancy of the international philosophy implemented by the American political intellectuals against the modern ideas of justice and equality that, in truth, founded our contemporary societies. The old time Shaker song came to my mind, as a statement of truthfulness and simplicity, and that the gift of freedom is that which needs to be valued most. It also becomes, I believe, a paradoxical contrast with the principles of democracy and liberty that were build by the European immigrant societies that constructed the idea of the United States – and, in a certain way, the statement of purpose for the international modern democracy. As groups who arrived to New York more than two centuries ago, the Shakers’ humanistic understanding of the world is important to remember. Additionally to the message of the song, the “Hollow Square Dance” and the architecture of the old meeting house acquire certain poignancy when thought against the vacuum of the hollow square of Lower Manhattan, yet as we ask how to fill this void, they present us with the option of going back to the philosophical foundation of modern human values. 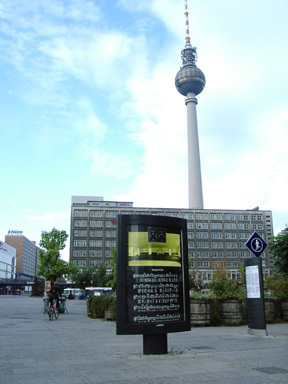 As this project at Alexanderplatz is intended to serve as a historical marker for a moment of fight for freedom, this present work commemorates the endurance of the idea of tolerance and desire of equality for all, particularly during trying times.